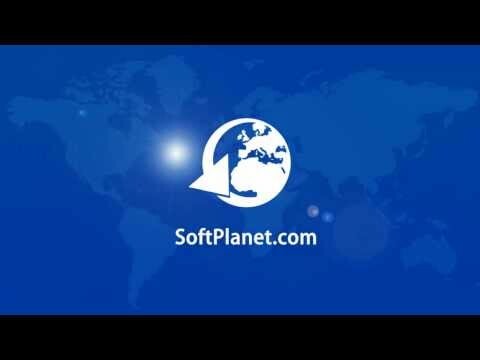 SoftPlanet makes it possible for everyone to get free ESET NOD32 Antivirus download directly from our servers. There is no registration needed for downloading. ESET NOD32 Antivirus 8.0.312.0 previously known as NOD32 is a powerful antivirus solution which can protect your computer in real time from all the threats which can slow down your PC or damage your files, or use your information in an unauthorized way. This program allows you to feel safe when you work online and offline no matter what you do. Any removable media such as USB sticks, media flash cards, CDs and DVDs are also scanned upon insertion, so the maximum possible protection is guaranteed. 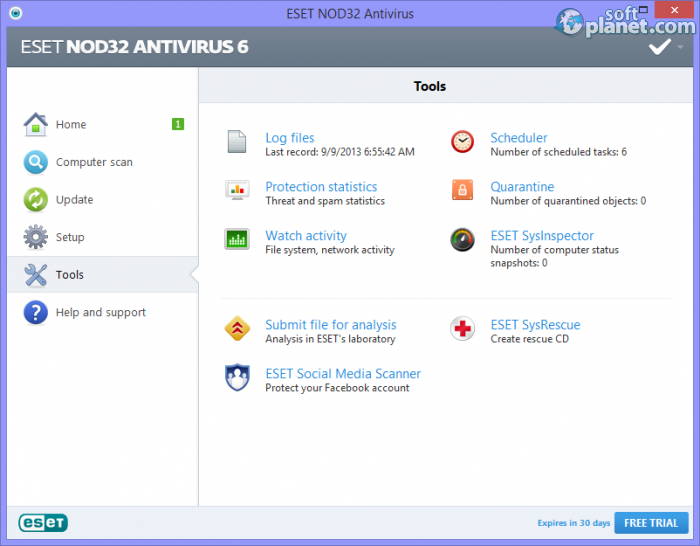 ESET NOD32 Antivirus comes with a 30-day free trial. The latest version fixes the issues with the activation in specific countries and with the program's icon in virtual machines. NOD32 can be used on Mac OS X and Linux desktop too. With Windows you will not have a problem to use it if your version is 2000, XP, Vista 7 or 8. Both 32-bit and 64-bit versions are available along with your language preference. The antivirus and antispyware, anti-phishing, cloud-powered scanning, removable media control etc. functions are only a few of the many tools this program uses under the hood. 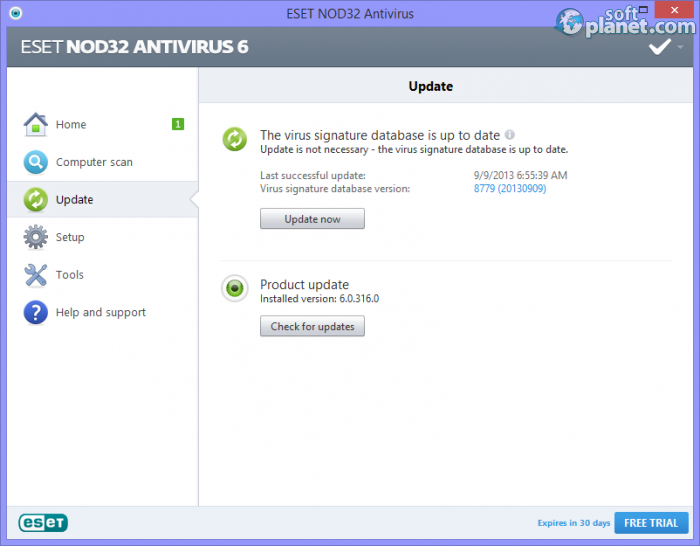 ESET NOD32 Antivirus starts to take care of you right after the installation procedure is completed. The first screen you will see is the activation screen. Make sure you select whichever option to ensure maximum protection. Then the program's interface shows you its real face. During the years that face has changed but all for good. Users can see the six main tabs organized in the left side pane, while their functions are shown with more details on the right. This mode is the standard one. There is an advanced mode too for those of you who want to have more options and features to work with. The OK sign in the upper right corner opens a drop-down menu which has the current level of protection shown, log files link, statistics and more. From there users can temporarily disable the protection and open the program's advanced setup. The primary goal of ESET NOD32 Antivirus is to protect your computer in real time. The second main goal is to scan PCs and removable media for malicious software. You can find all these functions in the “Computer scan” tab. Your options there are Smart scan, Custom scan, Repeat last scan and Removable media scan. There are also quick links to the scan logs and to the computer scan setup. In the Setup tab you can find most of the computer, web and email protection options and enable or disable them. Indeed, all other useful program features like Scheduler, Quarantine, Watch activity, ESET SysInspector, ESET SysRescue and more, are grouped in the Tools tab. For those of you to whom ESET NOD32 Antivirus 8.0.312.0 is not enough there is ESET Smart Security which has the full number of protection tools which ESET offers. But for any other casual user it is all that you need to keep the threats under control and away from your computer. If you want to have something that you can trust to fight malware with, you can choose ESET NOD32 Antivirus without any doubt. 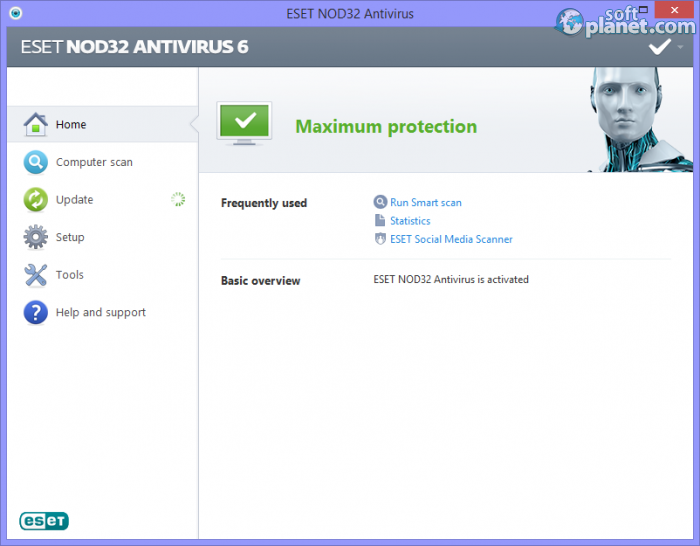 ESET NOD32 Antivirus is VIRUS-FREE! 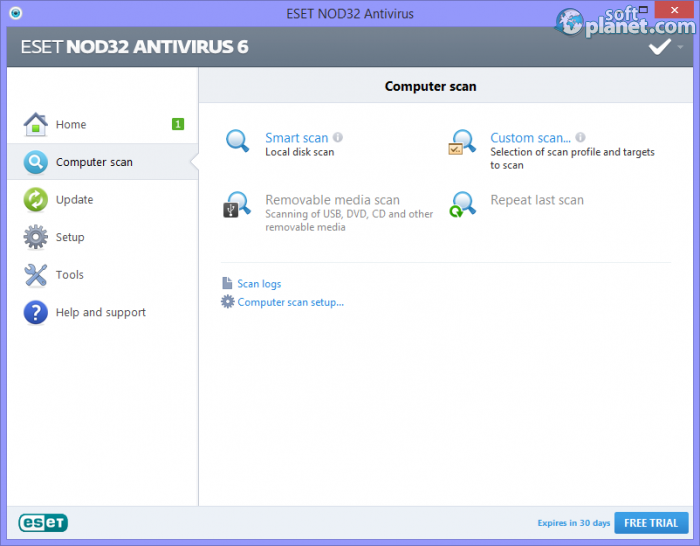 Our security scan shows that ESET NOD32 Antivirus is clean from viruses. The current version of ESET NOD32 Antivirus has been scanned by our system, which contains 46 different anti-virus algorithms. That ensures that ESET NOD32 Antivirus 8.0.312.0 is 100% safe for your computer.